The research is being led by Australia's Commonwealth Scientific and Industrial Research Organisation (CSIRO). Click for full size image. Image courtesy CSIRO. © Copyright CSIRO Australia, January 2014. Honey bees in Tasmania, Australia, are being fitted with tiny radio sensors in an attempt to better understand the insect's behavior and increase productivity on farms. It is also hoped that the research will provide insight into Colony Collapse Disorder, a condition currently decimating honey bee populations in many areas of the world. Through refrigeration, the bees are put into a resting state. This allows the sensors, which measure just 3.5mm across, to be attached using an adhesive. 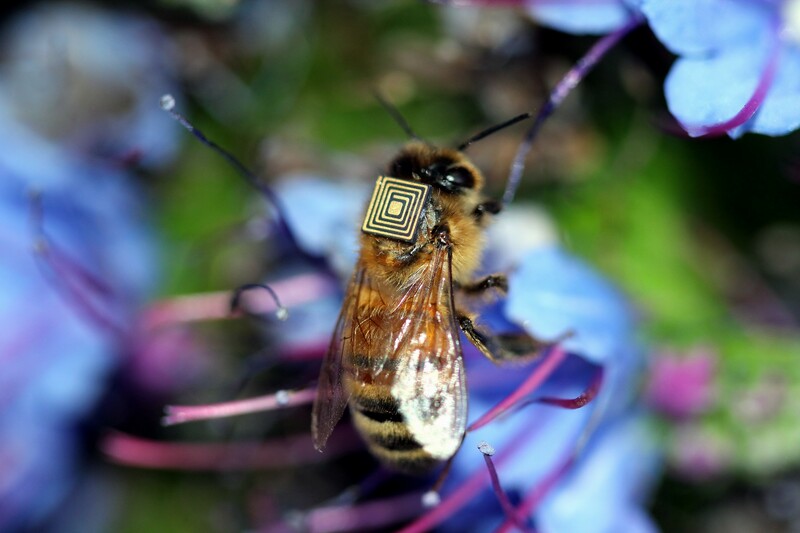 Up to 5,000 bees are being fitted with these sensors, which is the largest number of insects ever used in such a study. The researchers say that the next stage of the project is to reduce the size of the sensors to only 1mm so they can also be attached to smaller insects, such as mosquitoes and fruit flies. Video courtesy CSIRO. © Copyright CSIRO Australia, January 2014.